The U.N. Security Council unanimously approved tough new sanctions against North Korea on Friday in response to its latest launch of a ballistic missile that Pyongyang says is capable of reaching anywhere on the U.S. mainland. The resolution adopted by the council includes sharply lower limits on North Korea’s refined oil imports, the return home of all North Koreans working overseas within 24 months, and a crackdown on ships smuggling banned items including coal and oil to and from the country. The resolution, drafted by the United States and negotiated with the North’s closest ally China, drew criticism from Russia for the short time the 13 other council nations had to consider the draft, and last-minute changes to the text. Two of those changes were extending the deadline for North Korean workers to return home from 12 months to 24 months — which Russia said was the minimum needed — and reducing the number of North Koreans being put on the U.N. sanctions blacklist from 19 to 15. The Security Council has stood united for the 10th time “against a North Korean regime that rejects the pursuit of peace,” she said. U.N. Secretary-General Antonio Guterres also called for a political solution, “which requires de-escalation and open communication channels now,” his spokesman said. 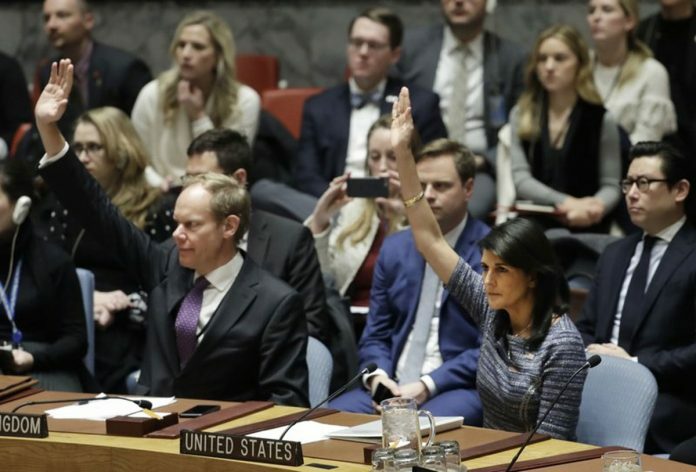 Haley recalled that the previous sanctions resolution approved in September, when combined with earlier measures, would ban over 90 percent of North Korea’s exports reported in 2016. That resolution, adopted in response to North Korea’s sixth and strongest nuclear test explosion on Sept. 3, banned North Korea from importing all natural gas liquids and condensates. It also banned all textile exports and prohibited any country from authorizing new work permits for North Korean workers — two key sources of hard currency for the northeast Asian nation. —The import of refined oil products, including diesel and kerosene that are key to North Korea’s economy, is capped at 500,000 barrels a year. That represents a reduction from the 4.5 million barrels North Korea imported in 2016, and a cap of 2 million barrels in September’s resolutions. And it means the North’s refined oil imports have been cut by 90 percent. —All countries must expel North Korean workers and safety monitors by the end of 2019. The resolution expresses concern that earnings from these workers are being used to support the country’s nuclear and ballistic missile programs. According to the U.S. Mission, there are nearly 100,000 overseas North Korean workers, with about 50,000 in China and 30,000 in Russia. —Fifteen North Koreans, including 13 representing banks overseas, and the Ministry of the People’s Armed Forces were added to the U.N. sanctions blacklist. The two others facing a travel ban and asset freeze are Kim Jong Sik, identified as a leading official guiding North Korea’s development of weapons of mass destruction, and Ri Pyong Chul, an alternate member of the Political Bureau of the ruling Workers’ Party of Korea and first vice director of the Munitions Industry Department. North Korea’s test on Nov. 29 of its most powerful intercontinental ballistic missile yet was its 20th launch of a ballistic missile this year, and added to fears that it will soon have a military arsenal that can viably target the U.S. mainland. The new resolution reiterates the Security Council’s regret at North Korea’s “massive diversion of its scarce resources toward its development of nuclear weapons and a number of expensive ballistic missile programs.” It notes that 41 percent of the population is undernourished. The resolution reaffirms the council’s support for a resumption of six-party talks on North Korea’s nuclear program aimed at the peaceful denuclearization of the Korean Peninsula. UN Security Council imposes new sanctions on North Korea. The resolution includes sharply lower limits on North Korea’s refined oil imports, the return home of all North Koreans working overseas within 24 months, and a crackdown on ships smuggling banned items.